Your car horn is installed in your vehicle for use when you cannot alert other drivers by any other means. However, honking your horn should never be abused. All drivers should strive to be as conservative as possible when it comes to honking their horns. Reserve horn honking for instances where it is necessary. The MyDriverLicenses.org experts advise against blasting your car horn for extended periods of time and in repeated patters in an effort to remain considerate to others on the road. To learn more about when to honk your horn and when not to, review information on horn laws below. Did you know that it is illegal to drive on the highway without a horn installed in your vehicle? According to the team at MyDriverLicenses.org, cars, trucks, mopeds and motorcycles must all be equipped with horns that can be heard from at least 200 feet away. However, these horns cannot emit harsh pitches or untraditional sounds/whistles. To use your car horn improperly is illegal. The experts at MyDriverLicenses.org warn drivers against blasting car horns repeatedly, in patters or by performing long honks. 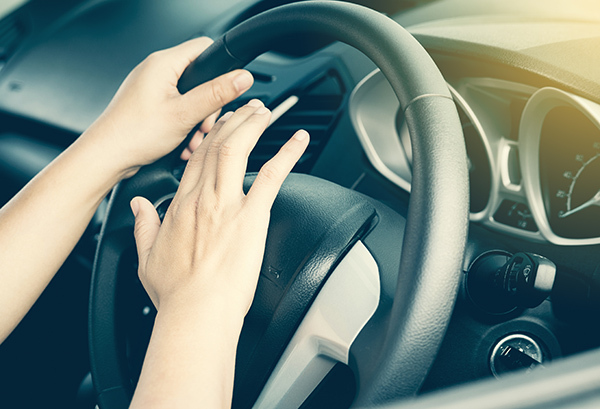 If a driver is caught using his or her vehicle horn improperly, law enforcement has the right to issue a traffic ticket and an accompanying fine. So, whether you are frustrated with the man in front of you who cut you off or you see your friend in the lane next to you and want to get his or her attention, know that honking puts you at risk of being ticketed. To honk your horn to chastise another is tricky, as there are scenarios that deem it legal and scenarios that deem it illegal. For instance, if you decide to honk the horn at the car in front of you after a red light turns green, you are in the right within reason, since the driver not accelerating affects the operations of the roadway. Another situation that calls for disciplinary honking is when you do so to a pedestrian who is not paying attention. You can honk your horn in this instance if you know that not doing so will put your safety or the safety of the pedestrian at risk. So, if a pedestrian is crossing the street at a green light when you are approaching, you can honk if slamming on your brakes might cause harm to the pedestrian, yourself or a driver behind you. However, honking your horn obnoxiously or in excess regarding the types of examples above may be grounds for a ticket. In addition, if you are honking at a pedestrian who you think is attractive to get his or her attention, this is illegal. What are the laws regarding honking while parked? When you are not driving, there are instances where you can use your horn legally. For instance, if you are parked in a friend’s driveway, you can honk your horn within reason to let him or her know you are there. Excessive horn use in this instance may be grounds for a ticket if you are disturbing the peace or breaking any noise ordinances that are in place in that specific town. The team at MyDriverLicenses.org encourages all drivers to use their car horns as a courtesy.